“No tooth brush?” She shook her head. Akash asked more questions. She shook her head every time. That was her first time. She was unprepared. She didn’t know it was the norm to sleep in the office when it rained. Her wristwatch showed 5:40, ten minutes after the official closing time. Her male colleagues had already changed into pajamas. One of them laid on a floral bedsheet under the ceiling fan. His head rested on a pile of green file folders; his eyes followed her every move. She looked around, slung her messenger bag across her body, and quietly walked out the door. She hurried down five floors; she wanted to reach her hostel before the dinnertime. She tried to gauge the rain. She peeked through the fenestration’s of the stairwell. She saw dense white curtain of fog. “It is not so bad,” she mumbled. She didn’t understand the big hoopla about Bombay monsoon. It rained hard in Delhi but people didn’t swap stories of their rain mishaps. She stood at the building entrance. Above her, rain hammered on the corrugated asbestos awning. She tied to find a rhythm. It matched an untuned bass on full volume of a broken stereo. She wiped her foggy glasses on her cotton shirt. She rolled the bottom of her jeans to her knees. She tried to contain her hair in a ponytail. The building’s watchman said, “Madam, you should spend the night.” She asked him about the latest cricket score and stepped out. Outside, the rain fell hard and deafened her ears. The visibility was less than an arm’s reach. The adjoining mud footpath and the Kelkar Road were filled with three feet of water. Dead leaves, dirty polythene bags, paan leaves, toffee wrappers, torn tobacco pouches, crushed cigarette and beedi cartons, and empty Bisleri water bottles floated aimlessly. She held her bag over her head for protection. Her glasses had an uneven collage of raindrops. Every few steps, she wiped them. 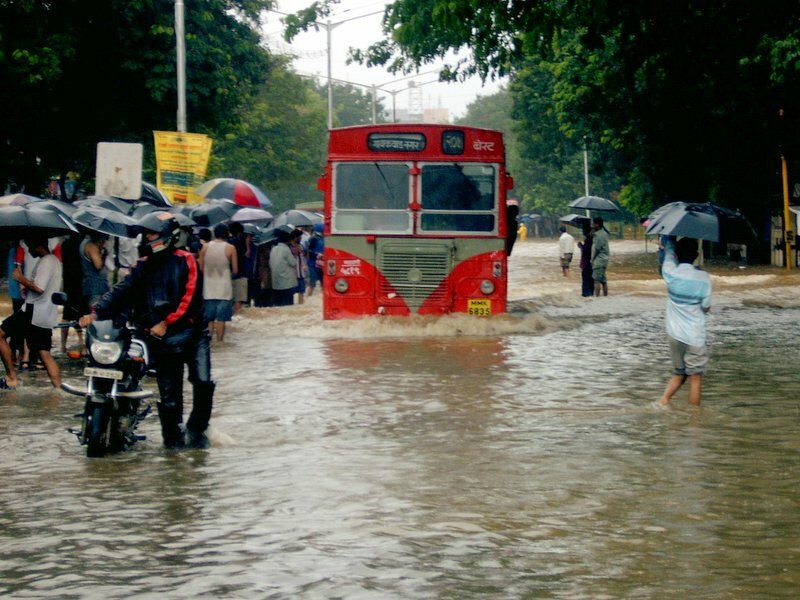 Unlike Delhi, Bombay’s rain was uncivilized and hit her at fifty-degree angle. She took off her glasses and kept them in her jeans pocket. Rain poured faster than the Bombay’s express train. Every time she tried to blink, raindrops clung to her eyelashes. Her sneakers squished. The sky thundered. She couldn’t hear her own breathing. Every step the rain hit her hard and gushed on her faster than her blood. Her body couldn’t bear the force; she couldn’t stand straight; she stumbled into a pothole. Wrappers and pieces of leaves clung to her shirt. Tears rolled down her face and were lost in the murky water. She accepted the rain. She hung her bag across her body; she hunched her shoulders; she widened her stance; she shaded her eyes with her hands. She looked around for a taxi. Motionless cars stood in the middle of the Kelkar Road. She knocked at the window of a green Maruti Suzuki. From the driver she learned that he was stuck at the same spot for more than an hour. She turned to look at her office building. Even though it was only few feet away, she could only see an outline. She saw the watchman’s red smoldering beedi. She waded past her bus-stand. Not one person stood near the pole marked Dadar to Colaba, Number 63. She felt the sole of her sneaker break free. She shivered; her cloths clung to her body; she felt naked. She tottered to the Dadar railway station. She didn’t have a plan. She rationalized that she could always go back to the office. 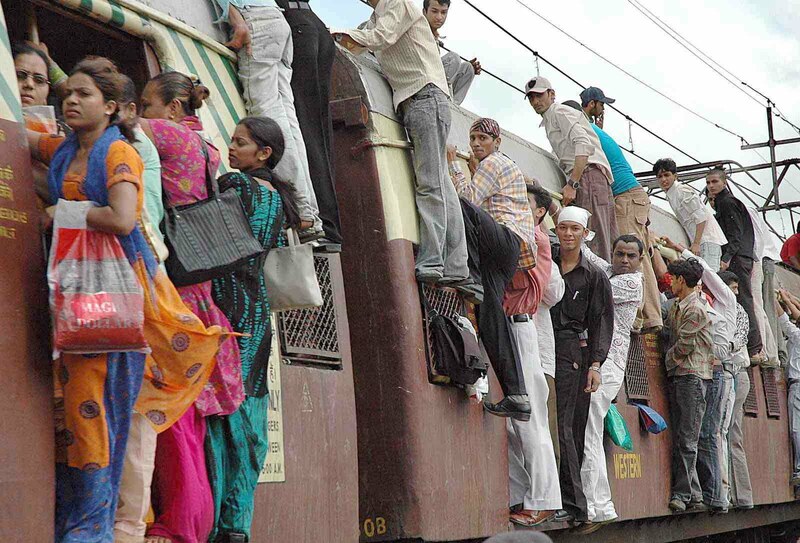 She learned that there were no direct local-trains to Colaba. That she needed to get down at Victoria Terminus and take a taxi to her hostel. Ticket-seller said, “Madam, today you will not find a taxi.” He cautioned that the locals’ tracks were waterlogged and the locals’ were running three hours late. She navigated her way through throngs of people, all in different stages of wetness. Some had two-hour damp smell, some were more dry than damp, some were simply wet, but most were drenched. Her sneakers made ssuuish-suush sounds. Her jeans ladened with water almost sagged to her hips. The light brown leather of her messenger bag shone and was dark brown. The rubber band of her ponytail was long lost somewhere on the Kelkar Road. She pushed shoved elbowed to make her way to the second-class lady’s compartment of the local to V.T. Instead of going deep inside the compartment, she stood near entrance. With both hands, she clung to the aluminum pole that divided the entrance. The rain was persistent, both in speed and intensity. There was not a moment’s pause in the downpour or the rush of women that hurried and pushed past her. She said, “This never gives-up?” No one heard her. Nobody answered her. No one cared. Soon she was pushed few feet away from the entrance inside the compartment. The local-train moved slowly. For twenty minutes, it protested against the rainstorm, fog, rust, and debris on its tracks. When it stopped, she asked around. Others were nonchalant. They said that it would take as long as it takes. Relax. She couldn’t. The ladies’ compartment smelled of Jasmine oil, sandalwood paste, stale food containers, damp saris, and sweaty cleavages and underarms. She held on to the overhead metal-handle with her right hand. An old woman with three long chin-hairs and two chins pressed her breast against her back. On her right, right under her armpit, nestled a short woman, whose gold mangalsutra rested in her deep cleavage. From time to time, involuntary she peeked inside the short woman’s sari-blouse. Women sang Bollywood songs to pass the time. She hated Hindi music. She sniggered rolled her eyes and made faces. No one noticed. A young girl with a Walkman stood across her, on left. The girl with the Walkman smiled at her knowingly. Bombay rain hammered on the trains’ roof. Rainwater bounced from asbestos roof to roof of the slums that lined the train tracks, to rest ultimately at the train’s feet. For two hours, her train stood drenched in its misery. Parts of her cloths were dry but most were damp. Her arms ached. The chin-hair woman sat crossed leg on the floor. 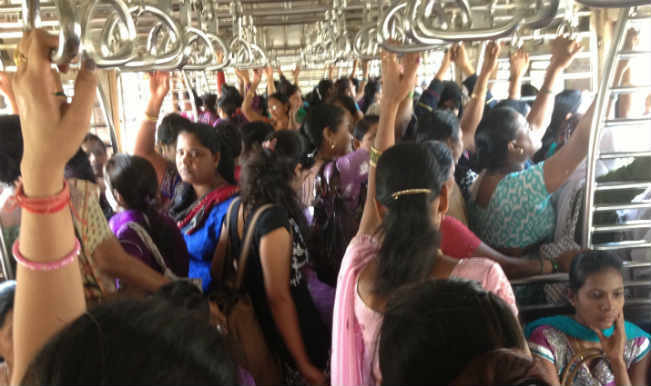 The mangalsutra woman had moved behind her to lean against the compartment wall. Women chanted religious songs. Some played cards. Some napped on each other’s shoulders. The Walkman-girl had her eyes closed. In past hour, she had maneuvered her way to the entrance. She held the aluminum pole with her right hand; she swung slightly outside the entrance; she felt the freshness of the rain. It was ferocious. She attempted to grip the monsoon in her left fist. She wanted its vicious energy. Her glasses were dotted with raindrops. Abruptly the wheels screeched and the local accelerated. The sky roared. She griped a silver bolt of lightning. It traveled through her body to pry her right hand from the aluminum pole. No one heard her scream. Not one person noticed. ← My obsession with grades.